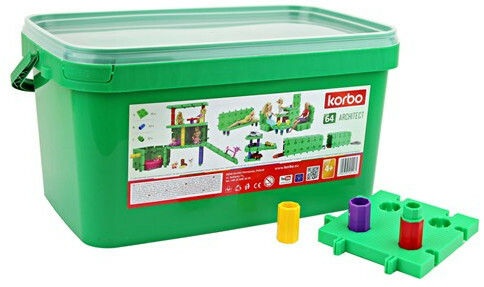 Korbo Technik is a set of 122 Korbo blocks based on a gear wheel, extended with additional elements: large gears, links, propellers. When connecting a large toothed wheel with a small gear, the child automatically learns the principles of mechanics creating mechanical transmissions. He spins and discovers the dependencies that follow. A large number of blocks allows you to build interesting, mobile structures. The enclosed manual contains examples, simple questions that stimulate the discovery of which direction the two gears lying next to each other are spinning, which wheel will return faster to the starting point, large or small?